Is it true that while everyone loves Portland’s regular 200-foot street grid, urbanists are turning away from it as something to emulate? Daniel Nairn, who just wanted to make a nice nerdy poster about street grids, points me to a fascinating Planetizen article by Fanis Grammenos and Douglas Pollard. It argues that the standard street grid, an easily repeated pattern where most intersections are four-way, is and should be history. The future, they argue, lies in more complex grids where there are a lot of street connections but where 3-way “T” intersections are the rule. It’s an excellent article. Read the whole thing. Inefficient use of land. Portland’s closely-spaced grid puts 42% of all land in the street right of way. That leaves not much land for development. Aesthetics. Any number of artists and theorists can agree that overly regular grids are boring. made of three-way intersections is ideal, as in this ITE diagram, which will look familiar to anyone who’s studied greenfield Transit-Oriented Development. Now, I’m not an urban design specialist, but I did grow up in Portland, and I’ve also tried to design transit networks for a huge range of cities. From those perspectives, something’s wrong here. Inefficient use of land. Portland’s grid uses 42% of all land for street right of way, but that’s a feature of the width of the streets, not the shape of the grid. Aesthetics. Humans “do not like endless vistas” in an urban context, says Andres Duany. True, but the endlessness of the vista is also a function of the width of the street. A grid where non-arterial streets are suitable narrow and visually interrupted won’t have this problem. Safety. If we’re praising the grid of 3-way intersections for its ability to calm private car traffic, are we perhaps still giving cars too much authority in determining this most fundamental aspect of our urban structure? The crucial point missing from the Grammenos/Pollard analysis is legibility. Grids are easy to remember. They fit our brains. Anyone who’s navigated Manhattan knows that the shredded street patterns of Lower Manhattan, below 14th Street, take up far more of your brain than the uniform grid that stretches from 14th Street to beyond 125th Street. In the latter area, which is about half of Manhattan, almost any location is easily described in terms that look like co-ordinates: Second Avenue at 73rd Street, etc. You can hold a huge part of the map of the city in your mind with very little effort. With those simple co-ordinates, your mind can jump to whatever location you choose, and often plot a rational course to get there. In short, the regular gridded area feels conceptually available in a way that the labyrinth of Lower Manhattan is not. Three-way intersections are routine, and where these happen on the arterial network, they are always the worst bottlenecks. No mode of transport can expect a reasonably direct path from origin to destination. As a pedestrian I can almost do it, but it’s still a complex calculation, requiring me to assess the unique angles and slopes presented by each street or path I might use. It’s not all that clear in the Google Earth shot, but most of the streets on this grid don’t offer Duany’s dreaded “endless vistas.” If you look up, you can see the mountains from any north-south street in the West End, but you can’t see continuously down the street, unless it’s a major arterial. That’s because the various obstructions that interrupt car traffic generally include some landscaping, so if you look a few blocks down a street, the ground-level vista is likely to end in some trees. It’s very pleasant. The long side of the Vancouver block (145 m or 474 feet) (generally 500-700 feet) is too long for my Portland-trained eye; with the wrong architecture, it becomes an oppressively long wall. But the point here is that the legibility of the grid is available to the cyclist and pedestrian. It’s easy for either of these modes to select a travel path based on just a few considerations — far less work than the advanced calculus required to plot the most direct path through Sydney. I would never claim that a fundamental decision about urban structure should be made purely for the convenience of transit. But I’ve encountered, and lived in, a range of emotionally powerful grids — from the intimacy of Portland’s to the empowering simplicity of Manhattan’s. To abandon the four-way grid for a more choked lattice of three-way intersections seems to be me not just bad for transit, but bad for peds and bikes too. Fundamentally, it’s bad for our ability to grasp our city as an entirety, and thus to experience it as available, and as ours. Transit and the Hierarchy of Needs, contd. Seattle’s Waterfront Streetcar: Not Coming Back? The grid in Vancouver is not great. Millions of dollars have been spend in attempts to make it bicycle friendly with limited success so far. Millions more will have to be spent. Even worse, there will continue to be battles pitting neighbour against neighbour as more traffic calming is proposed for local streets. These battles often go on for ten or more years. It is very expensive in terms of both staff time and capital cost to fix a grid. Without street closures, the grid is not very child friendly either. I never see children playing ball in the street as I did when I was young, there is just too much traffic. The traffic calming in the West End is a good start but unfortunately, this success from the seventies really hasn’t been repeated in other parts of the city. In general, I think it is much better as long as there are good cycling and pedestrian connections throughout the grid especially between neighbourhoods. The legibility and efficiency of a grid are true and real. The suspicion that people don’t like long vistas sounds like hokey-pokey to me. Lastly the complaint about land use efficiency is relevant only if street spaces are lost spaces. If streets provide shopping, playing and meeting spaces rather than simply being functional as arterials, then increased street space needn’t be a bad thing. Also if the grid provides shorter travel times then the extra street space could be resources well spent. Large vehicles (e.g. surface Public transport) need straight roads. I’d question Jarret’s caveat that “this fundamental decision about structure should be made purely for the convenience of transit.” If not for transit then for whom? Urban form is destiny. A lot of the perceived unpleasantness of grids has a lot to do with the width of the streets, and the heights of the nearby buildings and landscaping. SE Hawthorne, in Portland, is a lot more pleasant than SE Powell, particularly east of 42nd or so, as the multistory buildings further west of that point give way to single-story dwellings and offices. The trees make things a bit better, but it still has that “LA” effect. One problem with Portland’s grid is that while the east-west streets are FTMP continuous (except where interrupted by hills such as Mt. Tabor), the north-south streets are not. Between 39th and 82nd, there are no true through streets for n/s travellers, whether driving or riding the bus. Good grid is the one allowing people to move efficiently across the city. The T grid is certainly not in that category for good reason stated by Jarret. It seems to me that the size of the Vancouver DT grid is pretty natural, it is in line with the one of “Paseo de Gracia” in Barcelona, historic Berlin, or Wshington DC (DT) or LA (DT). I also think smaller blocks could lead to a waste of space, because one will agree that you a have minimum bound for the width of a street, while larger block make the whole thing less walkable too. I’m not a big fan of the strict geometric grids of North America for various reasons both aesthetic and functional, but I agree that arterials should be mostly long and straight, and the spaces in between them should provide some secondary through routes, even if they’re not as straight. And I think the big problem with Portland is not the spacing of the grid, but the fact that the basic unit of the street network is taken to be a standard street for cars, with one or two traffic lanes, plus parking lanes, plus sidewalk. While a fine-grained street network like Portland’s can be good, you really need to make the streets smaller, such as one driving lane plus one parking lane, or even just a pedestrian path and driveway (rather than street) for cars. Portland’s grid is way too small. It creates excessive intersections (and stops) and the sidewalks are too narrow. Manhattan’s superblocks are way big and don’t have alleys. Personally I think Chicago has some of the best streets around. They offer generous space for street trees and sidewalk space, have alleys and aren’t excessively long. The death of NYC’s streets is its lack of alleys. Garbage collection on the streets in such a dense city? I don’t know how they do it. I guess the moral of the story is that LA has it right. Right? An overriding grid with enough changes along the way to keep it from having too many endless vistas. In some ways we need a system that makes it difficult for a car to get through. Yet easy for a bus or bicyclist or pedestrian to traverse. If you break up a grid but give a way for a pedestrian or bicyclist to cut through. You have still left it easy for them. But you now made a transit route more difficult. A Transit route is easy to remember when you know that it will stick mostly to a certain street. When that route turns up and down through a maze of T stops. It is harder to learn the route and people are less likely to take transit. Ugh Sydney streets, when I lived there for a few years I came up with the theory that the original streets were built following the paths the cattle would take around the hills and grew from there. I found Sydney relatively easy to navigate on foot after living there for just a couple of months. London, on the other hand, is still confusing after nearly three years. It’s all about getting to know the long, uninterrupted roads – Oxford Street, for example. It is vital to know where these roads come from and go to. This helps form a road ‘web’ in the mind, from which your location in the city can be deduced. Australian cities seem to demonstrate a hybrid of European and North American street patterns; somewhat organised, somewhat random. Having read the other article, it seems that the statement about land-use is a general one. I.e. it will always be better to use three-way junctions and than a grid for any given street width. Also, I think all else being equal, its better to get the car to its destination more efficiently, as that gets the thing off the street and out of the way. Wanting to raise artificial barriers to car use, we should use congestion charging or similar instead, where the driver’s disincentive can then be put to some positive use rather than being ‘wasted’. Improving traffic flow also brings some benefit to local buses who are sharing those roads. I side with Jarrett on this one. The “endless vista” issue is pretty easily dealt with through road widths, building heights, and various streetscape elements (especially trees). Even a little topography can the shift the sight lines enough to create some enclosure. Grids look boring and geometric from above, but not from within them in my experience. And the percent of land developable argument is a little strange. Really, geometrically speaking, you can’t maximize usable land any better than perfect rectangles. When you start curving and slicing, you always end up with odd-shaped fragments. They can make nice little parks, but not much else. You’re right that the street widths dictate this more than anything (although Portland has many 60′ ROW, which are already pretty small). And you just have to confront the trade-off between rich connectivity and developable space in whatever configuration used. Someone did leave a comment on the original post that I found interesting. He claimed that the small blocks in Portland created difficulty for transit, because it limited the number of cars that could fit in a streetcar without blocking one of the intersecting streets. Do you know if this is true? Daniel. Yes, Portland’s MAX light rail system operates on-street through downtown, and the short blocks limit the system to two-car trains. In practice, this is only a constraint at the peak of the peak, and I wouldn’t call it a net negative for transit given all the ways that transit profits from downtown being as it is. This is not an issue for the Portland Streetcar, which is only a single car. That’s it, thanks. Right, I meant to say light rail. Savannah’s grid (yes that endless obsession of mine) offers both the 3-way and 4-way intersections but layers them over each other to effectively create 2 grid systems. One for pedestrians/bikes and one for vehicular travel. The simple four way grid of boulevards and avenues functions very nicely for transit and commuting traffic, and yet it is also a part of the well-lived and gentle urban environment of Savannah. Savannah has double the street intersection density of Portland and yet the 4-way intersection grid functions as effective blocks of 600’x600′ and 600’x1200′(+), which is great for transit! That fine grain also enables much higher effectiveness for small to midrise land use density (in larger blocks, developers are too tempted to accommodate off-street parking lots conceding that space to the vehicle). So even though 45% of all land downtown is right-of-way, it effectively encourages denser development patterns. I like the wide streets in Portland, because it makes it easier to install bike lanes in a lot of places. The more or less rectangular grid and the shuffling of crosstown traffic to roads like SE 39th (now Cesar Chavez Blvd, WTF?) and SE 82nd gives me hope that Portland will one day go all-out on bicycle boulevards like Berkeley and other places in California have (basically, you “dead end” the middle of certain residential streets to car traffic, tear up some of the pavement, make a nice little landscaped mini-park, and keep a thru path that pedestrians and cyclists can use.) Every time I walk around the city I see dozens of opportunities for bike boulevards! Ben. You can find some of the treatments you describe in Portland. For example, SE Lincoln St, from 20th to 50th, was once an arterial and even had a bus route on it until 1982, but today it’s all chopped up in the way you describe. One thing to say about the three way intersection also is that it can also allow traffic to flow through the grid efficiently without resorting to signalization. Savannah’s one-way traffic flows are well-modulated and evenly dispersed to work at separate levels of traffic speed & volume. It changes the scale of flow subtly and effectively and helps induce it to find its best home (for traffic that wants to flow fast and that which wants to stay local). But what is more important to the effectiveness is that 3-way grid is that it stays orthogonal. I think, Jarrett, this is more important. Without Savannah’s three-way intersections helping organize one-way flow, its grid wouldn’t work as effectively as it does now, for a number of reasons to much to get into here. Hey Jarrett, I’ll have to check it out when I’m there again in a few weeks. Thanks for the tip. I like the grid in Toronto. Being able to align oneself to an approximate North-South East-West is great for wayfinding. As for endless vistas, even a very mild hill will interrupt them. I think that it’s imprecise to say that grids are “easier to remember” than other forms. They are “easier to learn,” and maybe “easier to reference,” but I don’t think they’re any easier to remember once learned. Being easy to learn means grids are good for places with a lot of tourists, or places that are growing in population very rapidly. But for longer-term residents, the downsides of a grid may outweigh those benefits. I also don’t think grids are much faster for travelling between any two given points, which is why almost all grids are broken with at least a few diagonal streets. The difference between a strict street grid and a medivial mesh network of streets is kind of the difference between Chinese characters and an alphabet. An alphabet is relatively easy to learn but does still have some limitations. Chinese characters take longer to learn, but for people who use them regularly, they’re no harder to remember than remembering spelling is for alphabet users, and they have different limitations than alphabets do. Eric M. I don't think that a hard distinction between learning and remembering is necessarily useful here. To me what's appealing about the legibility of the midtown Manhattan grid is that you can identify almost any location in terms that tell you where it is and give you good indications of how to get there. That's important regardless of whether you're a local or a tourist, because either way it makes a large part of the city conceptually available. You can contemplate going to a new place in the city without the delay or effort involved of figuring out how to get there. Eventually, people come to this kind of knowledge of wherever they live, of course, even London or Sydney. But only eventually and imperfectly. And my experience in Sydney is that people move around in grooves — familiar paths that they've learned, but that may really not be the best ways to get somewhere. And I think that as different people settle into different grooves, you're in danger of losing the city and just becoming a bunch of unrelated villages sharing a patch of land. I exaggerate to make the effect clear, but that effect is there. I don’t share the assumption that orthogonal grids were better for public transport systems. 50% of the routes in an orthogonal grid run parallel to each other and don’t allow interchanges between them. Thus increases the number of interchanges in the whole system which makes it less convenient, distributes additional load to interchange stations and transverse lines. An orthogonal grid network might be simple to draw. It doesn’t deliver the maximum benefit for transport system, however. I think that preference for grids on small scale boils down to what one is used to most. For example when I need to walk diagonally through regular grid, I suffer similarly as Jarret while in gridless network. I prefer any shape of network that provides reasonably straight (or level, in hilly terrain) routes between various points of interest. The “feature” of chaotic networks is also that they make some routes more convenient for transportation than others, sometimes to the point where such route becomes a chokepoint. That’s not an issue. In effect, streets available for through auto traffic become only a subset of all streets, making the rest of streets more pedestrian-friendly. @Daniel: 60′ ROW is pretty wide, considering it can accomodate four lanes for cars and two very generous sidewalks. I am a big fan of the Manhattan-size regular grid with numbered streets. Numbered streets (and a simple rule for house numbers) allow you to locate any address without reference to a map. If there’s a larger-grid transit system set up along arterial streets, residents and visitors can find their way without even having to think about it. In cities with grids which are numbered along both axes–such as Manhattan (or my father’s hometown of Minot, ND), that is true. Portland, OTOH, only numbers its N/S streets (and has one section of town, North Portland, where no streets are numbered). In NW Portland (and to a lesser extent, NE Portland), the E/W streets follow an alphabetical pattern: Ankeny, Burnside, Couch, Davis, Everett, Flanders, Glisan. In other parts of town, not so much, If you don’t know where SE Clinton Street is, you’ll need a map or some other navigational tool to find it. (Also in Portland, and unlike New York–the terms “street” and “avenue” are used to signify the importance of the street, not as a navigational aide. 82nd Avenue, a major thoroughfare, runs parallel to 81st Street). One other interesting street naming system which is found in at least two Oregon towns: The use of U.S. Presidents as the names of streets along one axis of the grid, in order of their terms of service. My hometown of Oregon City does it, as does Corvallis. There, the street names can serve as a wayfinding guide, but only if you know which President served when. (They’re generally not intended to be used for wayfinding, but simply as tribute). Such grids are generally historical in nature and seldom reach into the 20th century, thus avoiding the politically sensitive issue of a George Bush street or an Obama street. How the several instances of multiple men from the same family becoming President–in particular the two Adams’s–varies from town to town. Humans tend to vote for and seek order, structure, patterns, and simplicity, an instinctive inheritance designed to make them exploit nature’s bounty. However, once they design their own habitat and make it too orderly, structured, and simple, they get bored with it quickly and have no chaos and randomness with which to create order, structure, etc which they love to do. It’s the same with politics. We vote for candidates who promise to impose order, organize everyone and everything, create simplistic plans and huge bureaucracies to make order out of the utter chaos of an entire natino of diverse people, yet once they’re in power and put everyone in their place, we have nothing to do and our creative, caring, human skills have nothing to practice on not to mention that we discover the new order is oppressive. People like Friedrich Hayek realized that you don’t need order from above. People seek order and create their own local order. What does this have to do with grids? Grids is design from above, structure, order, maximize transportation, movement across a habitat. But what about living in that habitat? Grids get us around, but once we’re there, the grid habitat is ugly, uncomfortable, boring. Take Phoenix. You can get anywhere there easily but once you get there, you don’t want to be there. You mention Manhattan, but the best neighborhoods in Manhattan have curved and angled streets like West Village, Soho, Chinatown, in fact downtown breaks up the grid pattern and creates wonderful, unique neighborhoods with character, flavor, excitement. People love to search, wander, discover, look, create order, create patterns, but unfortunately when politicians or planners tell them they can do it for them, people naturally agree but later on realize they just let the politicians and planners take all the fun out of their lives and now they live in an orderly, oppressive, ugly, structured society. Speaking of grids, I’m surprised nobody has mentioned the ultimate in griddiness that is Salt Lake City. Addresses there are purely cartesian, such 1432 North 800 West. Also I’m surprised nobody mentioned Seattle or San Francisco, both of which decided to build out a grid pattern, hills be damned, which has resulted in a lot of rather steep streets, and bus routes that have to stop every block because the hills are too steep for elderly people to climb. While grids are easy to lay out, they assume away things like hills and other natural barriers. They also assume that travel patterns go approximately equally in all directions, when that’s generally not the case, and there’s usually some centers with high concentrations of destinations. On the other hand, the point-to-point model of Boston or London, with streets running from one square to another, is really bad for subways, because the squares are the most logical places to put the station, but that’s also where the line has to turn from one street to another. Hence “Mind The Gap”. One of my favorite cities for wayfinding is Washington, DC. (The city itself, not the suburbs). For those unfamiliar, it’s got a rectangular street grid, centered around the US Capitol building (which makes the city rather heavy in the NW Quadrant), with N/S streets numbered, and E/W streets arranged alphabetically. Downtown you have A, B, C streets, then one-syllable street names from A-Z, then two-syllable names from A-Z, then three syllable names–beyond that and you’re in the suburbs, which tend to have their own conventions. Overlaid on the grid are the diagonal “state” avenues–major thoroughfares, each named after a US state (Pennsylvania Avenue, which connects the Capitol and the White House, being the most famous). Roundabouts, most of them named, are found at major intersections–and many of these roundabouts signify important destinations within the city (DuPont Circle, for instance). The state avenues form an irregular pattern which makes them useful for many trips–some converge on downtown and the capital mall, but many do not. Like many European cities, through freeways do not run through downtown (freeways do run into the city but terminate at surface streets; through traffic generally uses the Beltway). And of course, DC is one of the great transit cities in the US. I refuse to live in a city that isn’t on a grid. For all this nonsense, It is the BEST way to get around without having to have freeways for all. I think that some of the streets in PDX are a bit wide, but in general, This space is being repurposed away from cars and towards bikes/transit. Wide sidewalks encourage pedestrians to actually go places. I don’t know that we need 60′ wide streets, but I would like to see the analysis of anywhere else on what % of their land they use for ‘getting there’ you need to count driveways and parking lots in this total. Seperately- @EngineerScotty – 1) DC is not one of the great transit cities in the US. Almost no one in DC will ride a bus because they are scared of the crime (and with good reason… shootings on busses aren’t unheard of). Yes people ride metro, but that is a long-distance transit service, not a short distance one. 2) What about 395 /SE-SW freeway and Whitehurst? Life in cities adapts to every kind of pattern and circumstance it is given, and what creates boredom is more than city form. Life in Manhattan can certainly be as interesting as life in Orvieto, Italy. I like Orvieto. I wish had a culture that made Orvietos. But really, to have Orvieto, you need centuries of cultural time and building accretions without the vehicle. Definitely, you need a tolerance for making a living off tourists. Life there can be just as boring if you have the need for speed. The only thing one can say about boredom and city form is, maybe it is not the city, maybe it is you. Are bus shootings in DC common outside the “bad” parts of town (which DC has quite a few of)? At any rate, I66/Whitehurst isn’t a through freeway. You can view I-395 and I-295 as a through freeway, but given route these roads take (both coming from the south), it’s not a very useful one. I-395/295 would be more useful as a through freeway were it to have a direct connection to DC295 heading north to the B/W Parkway–but it doesn’t. The “Best neighborhoods” bit is just plain wrong. No, the Village isn’t the best neighborhood in New York. It’s a playground for rich people who want to pretend they’re different from the Upper West Siders. Gentrification doesn’t care about how the streets look; the gridded East Village is now as gentrified as the irregular West Village. This issue isn’t about wide streets for garbage collection, it’s about having to commingle with refuse while walking along the sidewalks. It’s a nuisance and detractant. Alley ways are key to utility, parking, and garbage placement. All cities with big blocks should have then in my opinion. Yeah, the problem with garbage collection in Manhattan is that every night and morning there are huge piles of garbage bags on the sidewalks. One of those bags will inevitably rupture and then there’s just a huge pile of garbage that gets strewn around the sidewalk. For all of NYC’s pluses, it definitely has the disadvantage of being rather filthier than many other cities around the world. As for non-gridded cities, in the US I can only think of Boston, Providence, and Santa Cruz. Literally just about every other city has some form of rectilinear grid. Hooray for standard street grids and alleys! I love them and who cares what anyone else thinks. The standard grid is great for so many reasons. One is that I like to take a different way home when I walk my dog, because there is something interesting to discover on every block. And I can take so many variant ways in a grid without walking too much further overall. Plus, when I really want to get somewhere fast, the few diagonal arterials are a breeze to fly down on bike, car, or foot. (interestingly though, few, if any of these diagonals have any bus lines on them because the rest of the transit on the grid is so efficient). As for the alleys, they are great for getting rid of ugly driveways that mar so many front lawns as well as the garbage, plus for some reason I find it great for going alley-hunting for treasures in the trash. Back to grids though: Since I live in Chicago, I have been to neighboring suburb of oak park where they purposely disconnected most of their street grid from cars on their Chicago side (during white flight). Of course you can still walk through, but man, the psychological wall is powerful. They don’t need to have any sign that says “Stay out.” The disconnected grid on one side of the street makes it pretty clear. I think grids should offer as much connectivity as possible and to cars too. Now, if Chicago could get rid of all the ridiculous one-way streets on the grid, that would be even better. Oh, one more thing, Chicago has great block parties where they close off the street on a neighborhood block and everyone on the street brings out the hot dogs and beer and moon bounce for the kids. Can’t have a block party without a grid either. Your statement “Fused grid is too complicate too since it force people to make different decision according the transportation mode” is just not supported by real world experience. Cities in Europe that have high levels of cycling and walking achieve this by making it easier and more direct to walk and cycle than travel by car. This is often done by closing streets to car traffic or non-local car traffic. Many towns have closed their downtowns to through car traffic requiring drivers to go around ring roads to get to the other side while cyclists and pedestrians can walk straight through. Another strategy is to have bike and ped only crossings of rivers, highways etc. Making the grid smaller for bikes and peds than cars is another effective strategy. People have no problem finding bike and ped only routes and often flock to them to avoid the hassle, noise, pollution and noise of motor vehicle traffic. It is time we started designing communities around pedestrians and bicycles instead of motor vehicles. Unfortunately. most “new urbanist” communities are still designed around streets and parking first and then make half hearted attempts to accommodate cycling and walking. “Pedestrianizing” downtowns has resulted in dead zones and business vacancies of so many cities. There are few good example of such spaces in the USA like Charlottesville and Boulder and their successes are probably tied to something less apparent such as having quality anchor stores. I’m not sure why cities need to go down the extremist road of banishing the automobile. They’re here and will be around for the foreseeable future (that doesn’t mean we should gut cities for the car either). Anti-car nuts really balkanize the urbanist movement, and I wish we could stop pitting modes against one another and find moderate ways in which all modes can work together. The way I see it is if we make cars the enemy, that couple with a kid who were on the fence about living on the city will ultimately move to the suburbs for less restrictions on their lifestyle. Pedestrianizing is giving the road space over to pedestrians. If there are no pedestrians, then they won’t just magically appear. If there are already plenty of pedestrians, then it could work effectively. But I agree, extremists of all kinds are often detrimental to your movement. Nearly all streets in Manhattan are free of bare garbage, in my experience. It’s true across multiple neighborhoods. Harlem is as clean as the Upper East Side, and neither is much dirtier than Singapore – and what dirtiness they do have comes from old pieces of gum and cigarette butts, not garbage. In fact, most buildings nowadays have garbage cans either inside or just outside, so the streets are usually garbage bag-free, too. I grew up in Boston and have lived my adult life in Seattle. I find Boston a better city for walking – probably because it was laid out for walking (and perhaps grazing cows) – but a terrible place for knowing where I am. I noticed as I walked there that people don’t even try to navigate, instead they routinely stop and ask for directions. Seattle’s grid is much easier to navigate (except where different portions of the grid collide), but less friendly for walking and not necessarily easier to get around. Frankly I’m not sure that one is better than the other for buses. But both Boston’ cowpaths and Seattle’s grid are better for pedestrians and transit buses than the incomplete arterial systems found in their suburbs, where pedestrians need to go way out of their way to get to places nearby, buses couldn’t get through if they wanted to, and traffic from subdivisions gets dumped onto the public arterial system at only one or two intersections. To me the question isn’t grid vs. non-grid as much as whether the road network has enough intersections to allow direct movements, especially for pedestrians. (One way streets in Boston that all go in the direction you’re not trying to go are hard to drive, but easy to walk). The biggest challenge in auto-dependence, in my mind, is the complete privatization of platting and street design, where the public sector plays a passive role and allows developers to propose and build street systems that fit their development needs, rather than achieve functional transportation objectives. 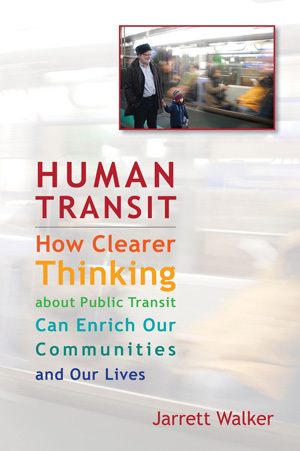 Many years ago in grad school I wrote a paper on land use and transit, and I interviewed some folks in Ottawa. I can’t find the interview now because my papers are all packed away for remodeling, but what I remember most was the revelation that within the major blocks defined by the arterial grid, often there were minor streets that were designed to allow for a non-circuitous bus route. Stops along these routes were required to be located within so many feet of major destinations, and these streets were the ones that had full depth pavement to accommodate the buses. It made me think that there is a lot of room for creativity to accommodate transit and allow for visual variation on the minor streets within a grid system. The result was very high mode shares in places where we would expect the opposite in the US, while allowing for curvy and calm streets within the grid. This was a long time ago, and I will be interested to find whether this is indeed true, but even if it’s not, it’s an interesting concept that stuck with me. Freeways, suburbs and busy arterials are far bigger problems for downtowns than pedestrian streets. Typically, streets were pedestrianized in many US cities as last ditch attempts save them from being abandoned. The pedestrianization not surprisingly did not help but neither was it the cause of the problems on the street. Cities all over the world that have successfully created pedestrian areas. You might want to apologize for insulting people all over the world including those in Barcelona where 53% of streets are car free. By the way, Barcelona has the lowest per capita GHG emissions of any city in the “developed” world. I agree suburbs and freeways hurt cities. That is why I think everyone should enjoy in what cities have to offer and they should appeal to everyone (so we can stop building greenfield suburbs), which may include not demonizing certain modes of transportation. I’m not saying gut cities for cars, and I’m not sure why you brought up such red herring issues. I am merely arguing that the 1970s “magic wand” ideas about urbanism are not realistic. Pedestrian malls *mostly* have been a total failure and have had 40 years now to prove themselves — which they have not been able to do so with the exception of a few locales. Anyways, is it fair to compare a city which was developed even before the bicycle was invented as proof that pedestrian streets work and we should start banning cars from cities? A lot of Barcelona’s streets are not wide enough to even facilitate an automobile in the first place. I would surmise most of the “pedestrian” streets are not as much by choice as they are by design. Now, with that said, there are obvious places where current auto access should be banned at least for a period of time. Pike Place in Seattle comes to mind as well as Times Square. I think they would be successful examples. 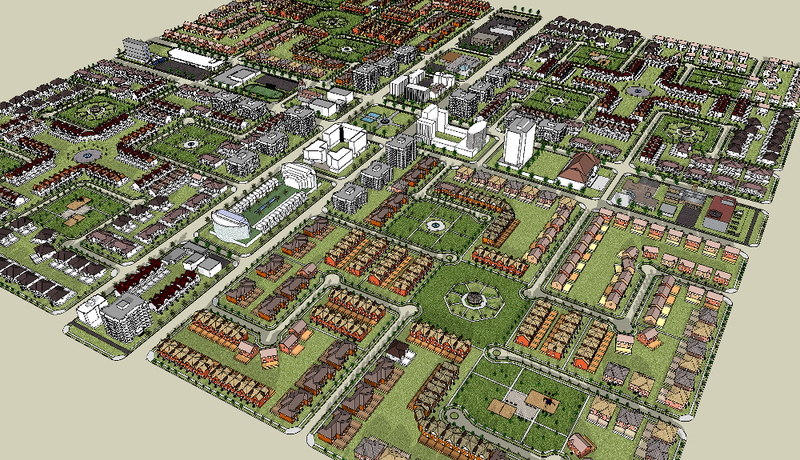 We need to get away from these black and white arguments about how urbanism works. Urban systems are much too complicated and dynamic for rigid applications. It’s like saying rails are better than buses, and that if you build more rails, your city will be saved. We can’t fall into those lines of thinking. ws: I think it’s a straw man argument. Nobody here is demonizing cars, nor even saying they should be banned. Now, I can only speak for myself, but one thing that I am saying should be changed is the designing of streets around the assumptions of automobile use. Most cities in the US are built with the basic unit of public thoroughfare being the automotive road, which implies a certain scale (generally, big enough for two travel lanes and two parking lanes). I am suggesting that by building a finer-scale network for pedestrians and bicycles, we can achieve the benefits of Portland’s closely-spaced grid without its big downside of wasted space. Note that my proposal doesn’t have anything to do with banning cars, and indeed I think most commenters here would agree with that. But I also think many commenters will agree that perhaps we should reconsider the vast amounts of thought and effort we put into increasing the convenience of automobile use in urban environments, and redirect that effort to other, more productive things, like getting people where they want to go. You’re still welcome to have your car, just don’t expect society to go as far out of its way to accommodate you as it has been so far. Something to keep in mind about the grid in Seattle. King County has a master grid that controls the numbering of streets and buildings. That way when you get to the border of one town / city and cross into the next the building numbers do NOT restart if the street name stays the same. The master grid is where the NW / NE / SE / SW / etc. tags come from. Contrast this with El Camino Real on the San Francisco Peninsula. Several times on the journey up / down the peninsula you will see the numbers restart. the European downtown has been out pedestrian as a way to rationalize traffic (too much pedestrian to share limited street space with car), not to provide different access route according your transportation mode per design as in the fusedgrid. and you will notice that in the illustration you refer to, the activity anchor is on the car friendly road, not the pedestrian friendly alley, and it is not by accident. Eric beat me to it, but after a weekend getaway to Savannah I was really impressed with the layout of their historic district. I was staying off of Forsyth Park, which was easy walking (or cheap pedicab when intoxicated!) distance to anywhere I wanted to go, so I never took transit, but I can’t see how it would be that hard. As you can imagine from looking at the map, walking was as easy as could be, even as a tourist. Quick look at a map before you leave and you are good to go. I realize I’m just a guy who visited Portland for 4 days and some of you live or have lived there. But I don’t think Portland streets are wide. Two travel lanes plus two parking lanes seems to be the most common configuration downtown. Parking lanes get an undeservedly bad rep among urbanists. Those lanes provide great flex space. From one block to another, or even within a block, you have the opportunity to program some of that space. It’s even possible to program different uses by time of day. The parking lane provides space for zipcar parking, electric car charging stations, bike racks and sidewalk bulbouts. They allow sections of curb space to be programmed for delivery parking, valet staging, or parking for commuter buses that need to stay at a stop a little longer than just during the load/unload period. Additionally, should either the sidewalk or the travel lanes require maintenance/construction the parking lane can be temporarily repurposed to accommodate the foot or car traffic displaced. The notion that the perfect street is just one or two travel/transit lanes, bike lanes and no parking lane is misguided IMHO. That depends on city’s policy, but generally, most of them provide some pedestrian only thoroughfare, so you’re wrong on this one. In effect, it perfectly fits definition of fused grid in spite of looking like anything but the drawing you posted. @paul – well said. And one of the biggest advantages of parking lanes, of course, is that they put a couple of tons of metal between pedestrians and moving cars. Cars are so dangerous that we need more cars to protect us from them! Why not put trees there instead? At least that way you get some shade. I like trees too, but in practice I find that a line of cars makes me feel that the pedestrian environment is a separate channel. In general (and more space and good design can mitigate this) I feel more like I’m still walking in the auto environment when only separated from cars by trees. Of course that’s just me. The other thing that on-street parking does is activate retail along local streets in urban areas, and the liveliness of retail is a key factor in having great walking environments, at least in my neighborhood. It fascinates me that designers seem to feel they just need to sprinkle trees everywhere to humanize their designs, and they always look great on paper, but there is a lot more needed to create a pedestrian environment that attracts actual pedestrians. Visual clues that retail is going on, I think. can be part of that equation. It’s a 18th century design. I don’t know of any place like it. Whereas cars need to circumnavigate the squares, peds can go directly through the area in straight lines. I think you need to travel more, or at least look at photos of cities that are designed around ideas of space and streets that are radically different from the North American model. In the case of through streets with fast traffic, you do need some kind of separation between the cars and the road, and by trees, I mean an entire planted space, almost like a really narrow linear park, with more than just a single row of widely spaced trees. Anyway, I think a lot of one’s perception of space strongly depends on what you’re used to. I’m not sure how my comments could be misinterpreted more. My main point is that automobile access is often best not to have automobile access or at least through automobile access on each and every street, especially on a fine grained grid like in Vancouver and Portland. The movement to the grid seems to be an overreaction to cul-du-sacs and super blocks and a misguided effort to blame them for automobile overuse. The real problem was not the street organization but more a lack of density, mixed use development and pedestrian and cyclist connectivity. All of this issues can easily be solved especially in new developments without resorting to an unconstrained fine-grained grid simply by providing pedestrian and bike connectivity, increased density and mixed use development. None of this is dependent on a fine-grained grid. It is actually puzzling that many new urbanists want a higher degree of automobile access than was available at the height of automobile based development. WS: there are cases where pedestrianization works, and cases where it doesn’t. It depends on how much retail there is on the street, how big of an attraction it is, how pedestrian-friendly the surrounding areas are, etc. The fact that it failed in Buffalo doesn’t mean it’s failing in Shanghai. If you go back through what I said, that’s almost exactly what I discussed: It’s a case by case scenario. In fact I argued of two cases where getting of rid of cars would create a very lively pedestrian experience (Pike Place). I am simply stating there are few areas where (long) pedestrian malls are achievable, bearing the monumental design and businesses roadblocks in place that would make such spaces successful or unsuccessful. Commerical/Retail spaces are worse off than the housing market is now, and someone making a bid for pedestrianizing a street on a marginally successful retail front would be misguided in their efforts, if not insulting to the adjacent shop owners. That seems to be some designers’ answers to “re-activating” downtrodden areas. Not to mention the difficulty in obtaining a loan from a bank when they see there’s no parking whatsoever on site or off. Not like I agree with the financial industries’ sprawl-skewed guidelines for financing…it’s just the current reality. @Richard. I, at least, do understand what you’re saying, but I disagree. I don’t see the standard grid as an overreaction to the cul-de-sac. As features of urban texture, regular grids are older than cul-de-sacs. In North America regular grids are often essential features of the late 19th century city that much New Urbanism wants us to emulate. Again, the key issue is legibility. New Urbanist theory that focuses on building one development at a time doesn’t really grasp the larger city-level issue of legibility — the sense of freedom and empowerment that comes from being able to keep a map of your whole city in your head. Given that there are other ways of taming cars and avoiding “endless vistas” I would need to see an argument for why the citywide legibility that the standard grid delivers is a bad thing. To access to the yellow area, pedestrian as well as motorist use the same road: Motorist could have restricted access according to time because the street can’t accomodate them due to heavy pedestrian during the days (what you explicitly mention in your comment). (In the fused grid, they can still access, albeit by a different route. and it is what is the problem of such a concept). Bottom line, in Brno, motorist and pedestrian have the same mental map of the city (what Jarret here emphasis a lot on the square grid, and I agree with and it is a clear asset in our nomadic society: learning curve need to be minimized at much as possible). I have honestly hard time to recognize those features in the map you send, which I believe match more another concept called shared space where car and pedestrian share the same space, albeit with some restriction access for motorist like according to time of the day. To confirm the say of my original comment: I see that only the central zone is fully pedestrianized, surrounded by a more “shared” zone, then, disregardng the fine graining of the grid and street wide, the rest of the streets in the city are fully accessible by car, eventually because pedestrian traffic doesn’t justify restriction access, and we can see that the scheme could be alterred in one direction an another one quite smoothly. The fusedgrid presented by Richard, by design doesn’t allow such adaptation to the change of the time. You refer in your post to something you call The Vancouver Block. This block is not really the “Vancouver Block” at all. It is more accurately the “North American” block. This same exact block, roughly 640 by 320 feet, is found in cities from Dayton Ohio, to Denver Colorado, to Seattle Washington, to Vancouver BC. It is the size and shape block that results when you take a 40 acre agricultural “quarter quarter section” and cut it into 8 equal five acre parts. We have Thomas Jefferson to thank, or blame, for this block. It was Jefferson who promoted the “Continental Survey”, a project to survey an entire continent, cutting it up into large numbered parcels, each one mile square. Jefferson promoted this Cartesian system as the ideal framework for the democratic utopia he hoped to help create: an agrarian utopia populated by yeoman farmers – spreading industry, self-reliance, and democratic decision making across the vastness of the North American continent. His ideal grid elevated no point, and consequently no man, above any others. The Jeffersonian grid is the exact opposite of the radial network, a road network style promoted by designers from Pierre L’Enfant in the 18th century to Peter Calthorpe in our own. The radial plan always elevates some internal point in the system to primacy, be it a palace, a church, a courthouse, a commercial building, or an open square. That is its scenographic power. That is what bothered Jefferson. The radial plan never celebrates the distant vista across the American landscape. The Jeffersonian grid ONLY celebrates the distant vista, the nation itself, not its individuals or centers of power. It is interesting that Jefferson himself did a plan for Washington D.C., a plan that still survives in the national archives. His plan, drawn in his hand, was a simple grid, with streets aligned to the cardinal axes. His plan was rejected by then president George Washington, who favoured L’Enfant’s radial plan, a plan patterned after the Palace at Villa Notre in Paris France. L’Enfant’s plan was eventually executed very much as drawn. Reports are that Thomas Jefferson was not pleased; feeling that L’Enfant’s radial plan was more suited to a kingdom or an empire than a democracy. Of course, as in all things, reality is complex. Those who argue that the universal North American grid was used more for pragmatic reasons than for political reasons are also right. The Jeffersonian grid gave fair and broad access to land in a market that had previously threatened to collapse under the weight of title confusion and insider trading (sound familiar?). The grid made land easy to sell and hard to steal (what a concept!). What then is the bottom line here? Because it is a simple subdivision of the 40 acre quarter quarter section, the 640 by 320 block is found everywhere in the US (west of the Applications, and in Canada west of the great lakes that is). When it came time to turn a 40 acre farm field into a city, the simplest way to do it, (and the way usually codified in the minimal regulations on city building in place at the time ) was to divide the a 40 acre parcel into 8 equal urban blocks. Your only decision (or the city’s only decision more likely): should i make the long side north-south or east-west? This block size has proven itself as both rational and flexible. Entire regions can be easily and incrementally urbanized, gradually allowing cities to extend themselves through numerous 40 acre “extensions” (as opposed to our present practice of “subdivision”, which of course leads to pod developments and no end of trouble for transit). Personally i love this block. I love it because it IS democratic in the way that Jefferson understood it. It’s perfect for transit and perfect for walking and pretty good for cars too. For transit, this grid type has just a third as many intersections per mile to as does the Portland grid type (and if you have ever ridden the Portland Streetcar you know how that slows you down), and for walkers 600 feet is not too far to go for a crossing point (remember, the maximum you have to walk is 300 feet, or one minute). Meanwhile, the virtually infinite extension of streetcar arterials on the half mile grid lines makes providing district wide, city wide, and even region wide transit service a snap. I suggest that Jefferson idea for Washington DC are more inspired by the Philadelphia grid (barely driven by democratic concern at this time), and that eventually conflict and jealousy with l’Enfant drove him to paint his idea as more democratic than the l’Enfant one. with obviously the Congress above all. The national Mall, illustrates the accessibility of the power to the people while still showing the power of the democratic institution. (I come from one of them rebuilt on a orthogonal grid at the height of absolutism power in France). That is, the “North American” is a model yet unequaled. Um, Condon is wrong on there being a standard American grid. I didn’t say it was a standard grid. It is a North American grid in that it is commonly found in cities where there is a robust framework of the larger Jeffersonian grid. Use google maps to look at “streetcar suburbs” of Minneapolis, Chicago, Denver Colorado, Seattle, Vancouver, Calgary, Edmonton, Saskatoon, Dayton, Kansas City, and many more. The ubiquity of the five acre block and the half mile grid of arterials is striking. Striking, that is, in the districts built between 1900 and 1950. After that point in time you can literally see the pattern breaking down, as the practice of “extension” gives way to the practice of “subdivision”. I am also referring more to the districts outside of downtowns, which cover much more land. Downtowns, such as the ones featured in the excellent discovering urbanism post, are often a horse of a different color. My point is only to draw attention to what seems to me to be an unacknowledged and unappreciated fact: there is much more unity to the North American grid than most acknowledge. The Chicago grid is square. It’s one eighth of a mile by one eighth of a mile. In the inner-urban core it’s not enough, so it’s interpolated to be one sixteenth of a mile by one sixteenth. The mile-by-mile or half-mile-by-half-mile thing is more common, but is completely different. There are many areas using standard grid spacing of arterials but cul-de-sac-style suburbs within each square. No, they don’t. In downtown, the fixed barriers create places like this, that are pefrectly permeable for peds, but the car driver that wants to go to upper left streets must take very different route to one taken by driver accessing lower right streets. City-wide, ped with basic driver-map in her mind navigates city fine thanks to frequency and legibility of transit network, but it doesn’t work vice versa, because efficient routes for car are different to those that transit uses. While visiting friends in a smallish Russian provincial capital, I happened to meet a man whose daughter married a man from Portland. This fellow had been to visit his daughter, enjoyed his time in Portland…and the very first thing he praised about it was how easy it had been for him to get around, and to know where he was when he went out for a run or walk. Grids, and numbered avenues – it worked for him, anyway. Grids are okay, but regular grids are insane. Driving downtown in any US city takes so long that it’s rarely worthwhile, because there are so damn many stoplights on every street. Big cities should have grids within grids: A large-scale grid, with blocks about half a mile in length, and one intersection halfway down each block leading into the enclosed areas on each side, which are gridded with shorter blocks. It might be just me, but I find it surprising that many of you consider perfect grids easy to navigate. To me, they are pretty much an opposite, as looking around, I could be anywhere in the grid – at least that’s how i felt in Barcelona, the European city with grids. You have a lot more patterns than just grids, even if you want to make it easy to remember: look at the circular shape of many European cities, for example (Amsterdam, Budapest, etc.) The radial roads look more like desire lanes to me than a grid. Of course, light rail could use fairly straight streets, i.e. curves with large radii, but not necessarily kilometers (sorry, miles) of straight road. Hey Guys!! I think that the photographs attached to the article belongs to 1950-75 period, this is because the grids mentioned here doesn’t match with the photographs. Why should cities be designed for transit? Put the transit underground and leave the city for people. Also, speaking as someone with no car, I cannot stand on-street parking for two main reasons: firstly, it’s difficult to see approaching cars and secondly (at least in Boston), it encourages people to park everywhere — in crosswalks, in bike lanes, in bus stops, wherever. As for the grid plan, it’s certainly true that one of its problems is that the streets in North America are too damn wide — there are plenty of European cities with grids that have survived from Roman times with narrow streets — but I disagree with the assertion that it makes cities easy to navigate. Maybe it’s easy to navigate from the air, but people using the streets are on the ground and I have always found that far from carrying an imaginary, idealized Cartesian plain in their heads, people navigate with landmarks. I know I’m some place because it’s different from another place — that’s one of the real problems with North American cities: so many of the buildings are either completely identical or block-length, blank curtain walls. Another issue with grids is that many of them are impermeable. You couldn’t put a narrow street through a block in New York, even partially.